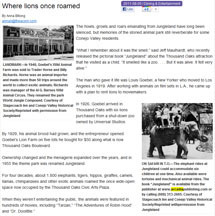 In 1926, animal attendant Louis Goebel bought five lots at $10 apiece as a home for his seven African lions along old Ventura Boulevard in a remote, sparsely populated portion of Ventura County just over the Los Angeles County line—where the city of Thousand Oaks eventually grew. Not surprisingly, the big predators became a roadside attraction. By 1929, Goebel added exotic birds and other animals. Premier woman tiger trainer Mabel Stark arrived as Goebel's Lion Farm accrued regional fame, and Capt. Frank Phillips trained Metro-Goldwyn-Mayer's famous Leo the Lion after the name changed to World Jungle Compound. The park maintained Hollywood ties, renting animals and hosting scenes for dozens of movies and television shows. 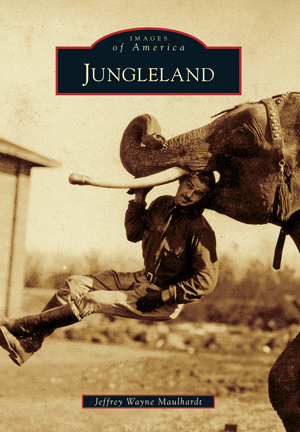 Jungleland became the zoo's lasting moniker after name and ownership changes. The enthusiastic opening of Disneyland in 1955 on the other side of Los Angeles inspired big plans for the Ventura County attraction, including a monorail. These plans fizzled, however, and Goebel resumed ownership in 1961. The park closed eight years later, and 1,800 animals were sold at auction. After four decades, the distinctive Conejo Valley lion roars were silenced. Author Jeffrey Wayne Maulhardt, the descendant of Ventura County pioneers, has written a dozen books on local history. He gathered these vintage images from public and private sources. The howls, growls and roars emanating from Jungleland have long been silenced, but memories of the storied animal park still reverberate for some Conejo Valley residents. In over 200 vintage photographs, local author Gary L. Hoving has amassed a collection of antique law enforcement badges, artifacts, and photographs of days gone by.